Royals from Belgium and Britain were on hand in Ypres again today to mark the centenary of Passchendaele, the third Battle of Ypres. King Philippe and Queen Mathilde of the Belgians represented their country at the commemorations, which included the official opening of a new museum. 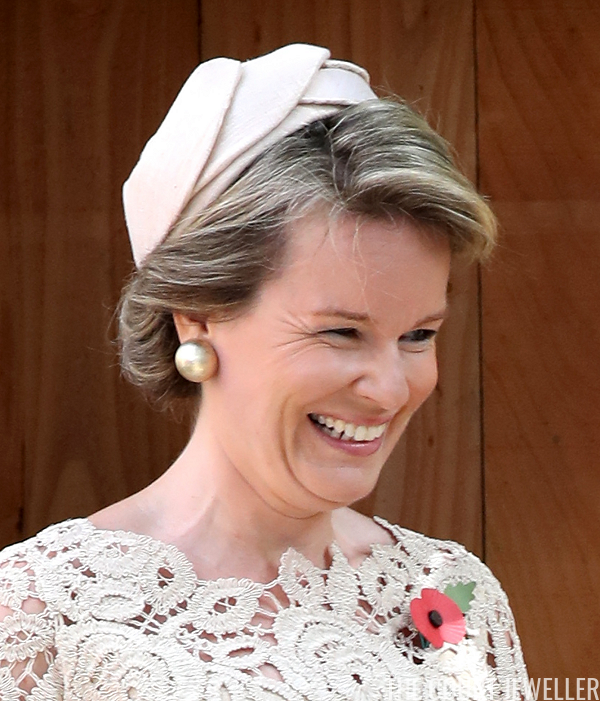 Mathilde chose a pair of large pearlescent earrings for the occasion. 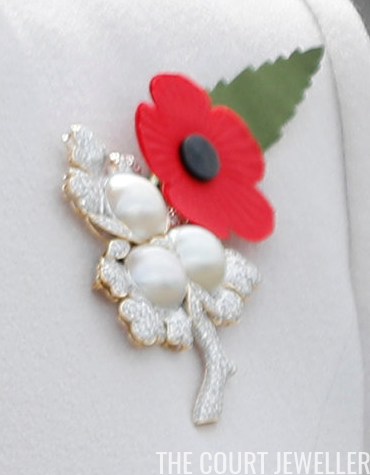 Pearls and other "white" jewels are traditionally worn on occasions related to mourning and remembrance. 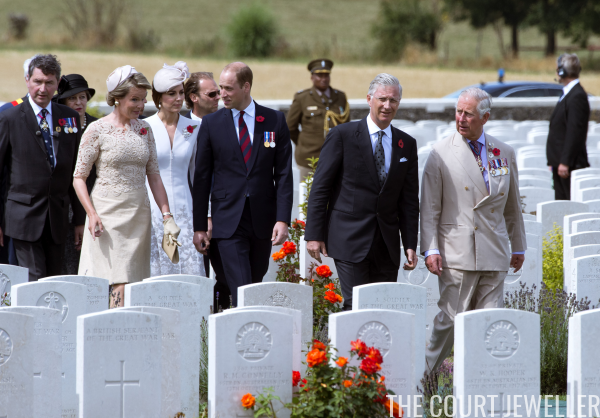 The Prince of Wales, the Duke and Duchess of Cambridge, and Sir Timothy Laurence joined Philippe and Mathilde in Ypres for the ceremonies. 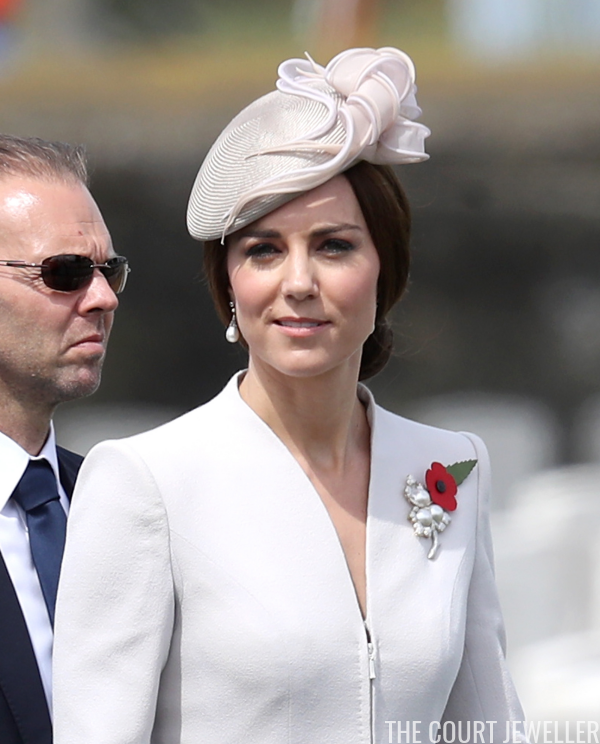 Like Mathilde, Kate also chose pearls for the day's events. Here's a close-up of her pearl drop earrings. 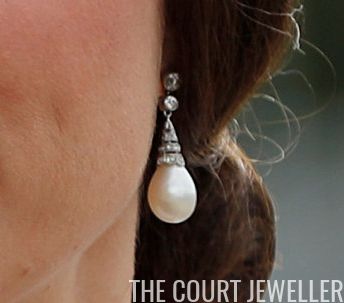 These are the diamond and pearl earrings from Collingwood worn by her late mother-in-law, Diana, Princess of Wales. Kate also recently wore these at the Spanish state banquet. Kate's brooch, a diamond and pearl leaf design, is a loan from Queen Elizabeth II, who has worn it very occasionally in the past. Both Mathilde and Kate chose creamy, neutral colors for their outfits today. To me, this makes sense on two levels. For one, white is an alternative mourning color -- that's why the Queen Mother wore her famous "white wardrobe" during a state visit to France shortly after her mother's death. For another, the neutral colors allowed them to blend in against the white headstones in the military cemetery, letting them fade into the background rather than drawing attention away from those whose sacrifices were being honored.